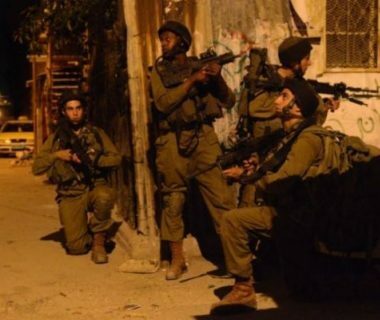 Israeli soldiers invaded, on Thursday at dawn, Hizma town, northeast of occupied East Jerusalem, searched homes and abducted a young Palestinian man. Local sources said the soldiers searched several homes in the town, interrogated a few Palestinians, and abducted a young man, identified as Mohammad Waheed Khatib. The invasion into the town is one of the dozens of invasions, and violent searches of homes, that escalated over two months ago, after the soldiers placed concrete block on the main road leading to it, and placed it under a strict military siege. Also at dawn, the soldiers invaded Hebron city, and the nearby Beit ‘Awwa and Doura towns, in the southern part of the occupied West Bank, and the al-Far’a refugee camp, south of the central West Bank city of Tubas, and abducted seven Palestinians, six Palestinians in Hebron and one in Tubas, during extensive and violent searches of homes.